Belize is a small country of roughly 8,000 square miles (20,000km sq). It is located on the Caribbean coast between Mexico and Guatemala: an exotic, English-speaking, adventurer's paradise, just a couple of hours away from three major United States cities. Almost half the country has been preserved as nature parks and reserves, including tropical forests teeming with wildlife and hiding mysterious Mayan ruins, and 174 miles (280km) of coastline featuring the longest barrier reef in the Western Hemisphere. The reef and the country's numerous offshore cayes, or atolls, have made this one of the world's most desirable destinations for scuba divers and marine researchers. 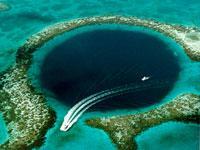 They come to explore unique features like the famous 'Blue Hole', a collapsed submerged cave 1,000 feet (305m) in diameter and 412 feet (126m) deep. Archaeologically Belize is fascinating too, having been the site of mighty Mayan cities from around 1,000 BC until the inexplicable disintegration of that great civilisation around 900 AD. There are believed to be thousands of Mayan ruins in Belize, of which about 600 have been discovered and excavated, many now open to tourists. Like most Caribbean countries Belize was occupied by British and Spanish colonialists over the centuries before gaining independence (only lately recognised by neighbouring Guatemala which laid claim to the territory) in 1981. Today it is a happy-go-lucky multi-ethnic nation of warm, friendly people, very welcoming of the tourists on whom the country's economy relies heavily. The main urban city (although not the capital) is Belize City, which offers some attractions like a zoo, museum, historic buildings and the Maya site of Altun Ha. Mainly, Belize is a destination for the outdoor enthusiast and active traveller and visitors should not expect urban adventure. There are not many nightclubs, expensive shopping venues or fancy restaurants, but there is plenty of scope for diving, snorkelling, fishing, hiking, birdwatching, kayaking, and exploring. We are looking for contributors for our Belize travel guide. If you are a local, a regular traveller to Belize or a travel professional with time to contribute and answer occasional forum questions, please contact us.